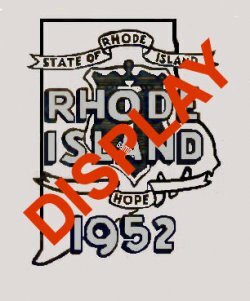 1952 Rhode Island REGISTRATION Sticker - $20.00 : Bob Hoyts Classic Inspection Stickers, Add a Final Touch to your Restoration! This Rhode Island Registration sticker was issued in 1952 and expired in 1953. Apparantly, Rhode Island did not issue a license plate in 1952. This sticker would validate the 1951 License plate until the 1953 plaes were issued. The back of the sticker verifys the above information and does not allow for any personal data.